Bookings for this event are not yet open. Please check back in soon for tickets will be available on sale as of Tuesday 23rd April. If you have any questions or queries regarding the 2019 Nurturing Creativity Conference program, bookings or details please contact us! Tertiary Students and Pre-Service Teachers are entitled to receive a student discount. To buy a Student Discount Ticket, please book directly with Zart Education by Phone or Email. Please have your booking information, session selections and payment details ready before calling. For Group Bookings of 5 or more people, please proceed to book now and enter your ticket quantity of 5 or more. The individual ticket price will automatically adjust to apply the group discount across all tickets. For more information or assistance with bookings or invoices for Group Bookings please contact Colleen at Zart Education. Bookings for this event are essential. Tickets can be purchased via the Zart website. Payment options include invoicing to an existing school/organisation account with or without a Purchase Order, or pay with PayPal or Credit Card when booking. To invoice to a school, you will need a Zart Login. Please have your login and password ready, or take a moment to sign up now before proceeding. Please have your booking information and AM & PM breakaway session choices ready prior to booking, as you will be required to register your chosen sessions during checkout. Please be sure you have carefully selected your session choices, as the changing of sessions is not permitted once registration is complete. 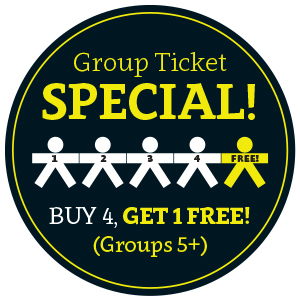 A Group Booking Ticket Special is available for bookings of 5+ people (Buy-4-Get-1-Free!) When booking, simply select a ticket quantity of 5 or more and the individual ticket price will automatically adjust to apply the group discount across all tickets. Please have all participant booking details and session selections ready prior to proceeding with your booking. 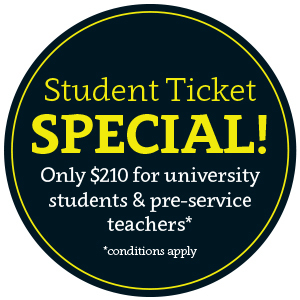 A special Student Discount is available for Tertiary Students and Pre-Service Teachers. Student Tickets must be purchased directly with Zart Education via phone or email. Please have your full booking details, session selections and payment details ready prior to booking. Once a booking has been made, each registered participant will receive a booking confirmation directly to their individual email address. Invoices/Receipts will be forwarded to your email OR directly to your school accounts email if booked on a school/organisation account. The invoice/receipt should arrive within 48 hours. Please contact Zart Education if your invoice or confirmation is not received in this time. When invoicing to school/organisation account payment is required within 30 days from the invoice date, unless alternative arrangements have been made with Zart in advance. Failure to pay the invoice by the due date will result in the cancellation of your conference ticket. Written notification of cancellation must be received by Zart prior to the advertised booking closing date (30th August 2019) in order for a refund to be made. Failure to attend this event without prior cancellation will result in the forfeit of a refund and payment of your invoice will remain due and payable in full. If Zart is compelled to cancel a workshop, session or event, you will be advised as soon as the decision is made, and all money paid will be refunded. 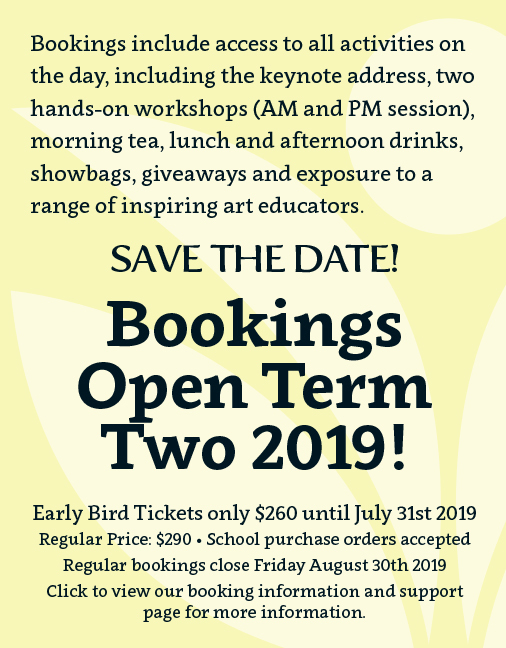 Zart cannot guarantee that all individual presenters as listed in the program will be available on the day of the Art Educators Conference to deliver the scheduled session. In such an event Zart has the right to substitute the original presenter with another qualified presenter to run that session, without penalty to Zart Art. Failure to attend this event without prior written cancellation prior to 30th August 2019 will result in the forfeit of a refund and payment of your invoice will remain due and payable in full. Individual Certificates of Completion will be emailed to all participants after the event. Bookings and payments must be made in advance, as outlined by Zart. Attendance will not be permitted without booking prior to 30th August 2019. Once registered, the changing of sessions is not permitted under any circumstance. Mobile phones must be switched off or turned to silent during the Keynote Speaker and workshop sessions, unless required as part of workshop participation. At no time are children to accompany their parent to this event. Nothing but an open and optimistic attitude! All materials and catering are supplied by Zart. Some breakaway workshop sessions may require you to bring your own personal technology. This will be outlined in the workshop details if required. Additional information may be emailed to registered session participants prior to the event date if necessary. You may wish to bring a camera to capture your progress throughout the day as well as inspiration from the presenters and other participants. Please be sure permission has been granted before photographing another participants’ face or artwork. Some parking may be available onsite, but otherwise most parking will be offsite. Please plan ahead to accommodate tor traffic, public transport, or finding a carpark in the area to ensure you arrive with plenty of time and in good spirits. Zart reminds all delegates to carefully check all parking signage before leaving your car. Zart is not responsible for any parking infringements incurred offsite. Zart will be filming and photographing this event for the purposes of publication in print, on our website, and on our Social Media platforms. Should you NOT wish to be photographed, please speak to our photographers on the day or locate a Zart team member to assist you. You may wish to bring a camera to capture your own progress throughout the day as well as inspiration from the presenters and other participants.